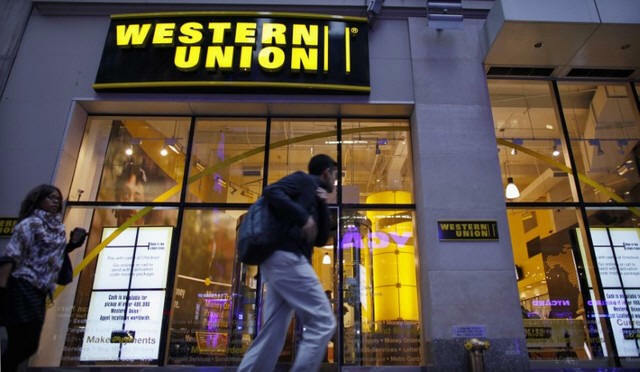 WASHINGTON (Reuters) - Western Union Co, the world's biggest money-transfer company, agreed to pay $586 million and admitted to turning a blind eye as criminals used its service for money laundering and fraud, U.S. authorities said on Thursday. Western Union, which has over half a million locations in more than 200 countries, admitted "to aiding and abetting wire fraud" by allowing scammers to process transactions, even when the company realized its agents were helping scammers avoid detection, the U.S. Department of Justice and the Federal Trade Commission said in statements. "Western Union is now paying the price for placing profits ahead of its own customers," said Acting Assistant Attorney General David Bitkower. A Western Union spokesman said that the company didn't "do as much as it should have" to oversee its agents between 2004 and 2012 but is committed to improving its procedures.